Enjoy six summer nights rocking out to tribute acts covering the best in rock n' roll history! Bring a lawn chair or blanket, and enjoy a summertime tradition that features cold drinks, great food and awesome music! No outside food or beverages allowed. Prices subject to change. Local music school, School of Rock, will be showcasing their top students during this rock n' roll set featuring songs we all know and love! No outside food or beverages allowed. We have a rockin' line-up of food and beverage vendors for you to enjoy as you dance the night away! Prices are subject to change. Parking: The entrance to the concerts will be through the Pre-Emption House Visitor Center. The Visitor Center will close approximately one hour before the concert ends and all patrons must exit via the gate on Webster Street. Parking is available in the Municipal Parking Garage on the corner of Eagle and Aurora and in the Naper Settlement visitor's lot on Porter Avenue and Webster Street. Not Permitted: Do not bring coolers, full or empty containers, open or closed bottles, outside food and drinks, pets, or weapons onto the premises. Weather: Naper Nights is a rain or shine concert event. In the case of unsafe weather – lightning, tornado, extreme winds/hail, etc. – Naper Settlement will close the grounds. Ticket and beverage ticket purchases are non-refundable. All events and prices are subject to change without notice. Special event rates may vary. The Goddesses of Rock are a female powerhouse cover band who rock out to songs by artists like Janis Joplin, Pat Benatar, Madonna, Lady Gaga, Gwen Stefani, Heart, Tina Turner, and more, all backed by their amazing band! Witness the incredible songwriting, vocals, and pianistic virtuosity of Billy Joel on stage as Brian Harris weaves together Billy Joel vocals, concert pianist "chops", and endless energy in a show that will leave you dazzled! The Belfast Cowboys are a nine-piece band that specializes in the music of Van Morrison. Powered by a four-piece horn section, the Cowboys have risen to the top of the renowned Minnesota music scene, packing houses and wowing crowds since 2002. This full-production Pink Floyd tribute showcases an energetic and phenomenally gifted cast of nine passionate musicians and vocalists alongside a mesmerizing light show. Come see and share what the excitement is all about as Think Floyd USA celebrates the 50th anniversary of the Moon Landing with a full performance of Dark Side of the Moon. This is a tribute to Woodstock - the performers, their music, and to the concept of peace and harmony. 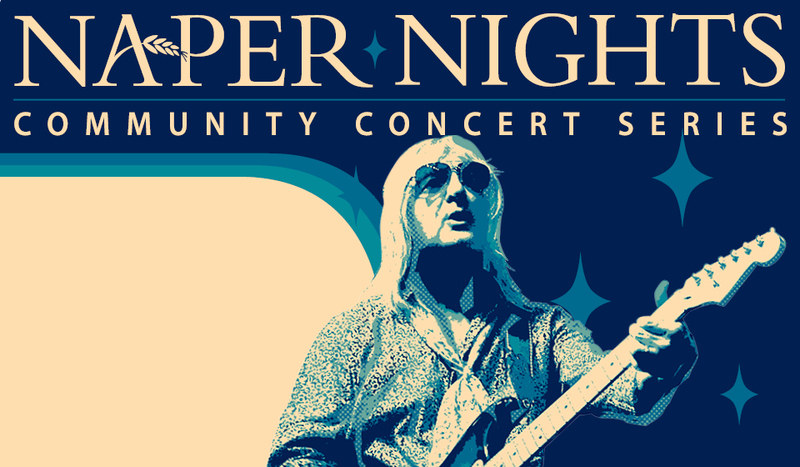 Covering the most popular songs, Soundtracks of a Generation will take Naper Nights on a musical journey chronologically through each day of the festival. Every spectrum of musical genre - from Rock Blues, Soul, Jazz Fusion, Latin Rock, and Psychedelic Rock - will be performed at this counter-culture commemoration. Join us as we celebrate the 50th anniversary of The Woodstock Music and Art Fair and jam to the songs that have become the soundtrack of an entire generation. Showcasing the astounding breadth and depth of The Band's distinctively original Americana music, The THE BAND Band brings the music of The Band alive with authentic, true-to-form renditions of their extraordinary repertoire, including "The Weight", "The Night They Drove Old Dixie Down", "Up On Cripple Creek", and more. Join us as these New York natives make their Midwest debut with a Naper Nights end of the season Woodstock blowout! Rico is defined as a band with a rich sound of diversified musical cultures. A mixture of sophisticated melodic genres comes together in tribute to the music of Santana. Rico creates an immense fiery soulful sound through bass, congas, percussion, drums, timbales, keyboards, guitar, and pure passion. The band will move you physically and mentally with their hypnotic blend of afro-cuban rhythms, or purge deep into your soul with their eminent sense of melody.